Ossification of the Posterior Longitudinal Ligament (OPLL) is a condition in which the posterior longitudinal ligament becomes thicker and less flexible. It is a multifactorial hyperostosis disorder commonly found in men. It is a condition in which abnormal calcification starts on the posterior longitudinal ligament. The most common symptom arises is in the cervical spine region most often C4-C5 region. 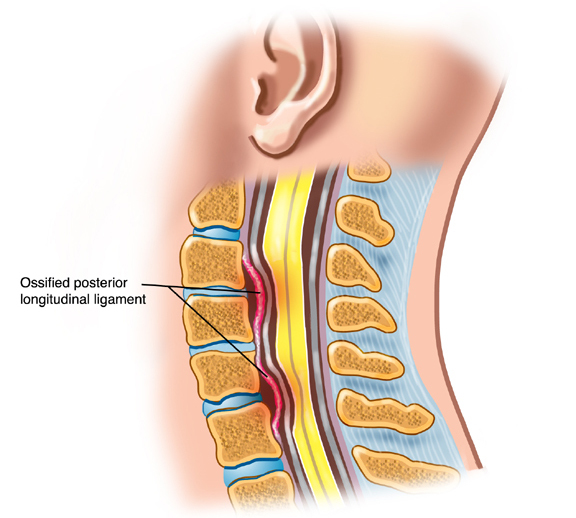 OPLL can narrow the spinal canal and causes cervical spine stenosis and Myelopathy (spinal cord compression). The majority of the patients have no symptoms at all. Symptoms of Myelopathy includes difficulty in walking and difficulty with bowel. It also includes pain, tingling and numbness in the neck. The cause of OPLL is not known. It can be caused due to genetic, hormonal, or environmental factors. There is a higher correlation to people with diabetes. Stretching helps to build flexibility and reduces pain. Add spine stretch or lower-back rotation stretch to your daily routine. Use a hot water bottle or heating pad to reduce stiffness and pain. A warm bath also helps, especially before exercise. Don't go for heat therapy if you have diabetes, vascular disease, an open wound or dermatitis. First consult your doctor then apply heat therapy. Use an ice pack or cold gel pack on painful joints to help reduce swelling. After exercise, cold therapy can help to reduce inflammation. Don't apply ice for more than 20 minutes at a time. Acupuncture is an ancient remedy for pain. It involves inserting thin needles into specific points in your palm skin. It activates your body's pain-relieving hormones. Massage helps you to relax. It also helps you feel more flexible so that you can exercise or stretch. The more you sit, the stiffness in the joints increase. Get up, move around, and stretch regularly. Gentle exercise programs such as yoga is good for OPLL because it incorporates stretching. Strengthening exercises can help to build muscle, which supports joints. 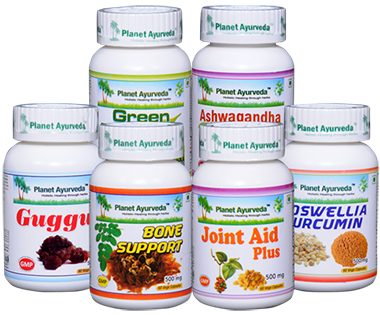 Planet Ayurveda is a well renowned company which is run by our well-known doctors' team. Planet Ayurveda always uses natural herbs to treat their patients of chronic diseases. According to Ayurveda, there are three dosha Vata, Pitta and Kapha. If there is an imbalance of one of these, then you have to face serious complications. You need to maintain balance of three dosha to live disease free life. The main cause of joint pain like OPLL, according to Ayurveda is, an imbalance in Vata dosha. Due to an imbalance in Vata dosha there is an accumulation of toxins in weaker parts of the body resulting in joint pains. But the proper Ayurvedic treatment and healthy lifestyle, you can help one overcome this problem. Our Planet Ayurveda Doctor and expert team have prepared their products using the best quality of herbs and by following principles of Ayurveda. All the herbal products are made from natural herbs. Our wide range of herbal products includes Herbal powder, Herbal capsules, Herbal teas, Herbal tablets, Herbal oil, juices, beauty cosmetics etc. Plant Ayurveda herbal product for the management of OPLL is in the form of Healthy and Happy Joint Pack. These herbs are good sources of calcium, which keeps are bones and joints healthy. Dosage: 2 capsules twice daily, after 30 min of meal. Guggul Capsule offered by Planet Ayurveda are prepared from pure extract of Guggul resin. The herb Guggul (Commiphora Guggul) is a potent inhibitor of the enzyme NFKB, which regulates the body's inflammatory response. Several studies proved that there is decrease in joint swelling and inflammation after administration of extracts of Guggul resin. Guggul capsules are used to balance Kapha dosha in the body. Dosage: 1 capsule twice daily after 30 mins of the meal. Boswellia-Curcumin Capsules of Planet Ayurveda are most effective combination for anti-inflammatory response. Boswellia serrata (salai Guggul) or Frankincenseis a remarkable new treatment made from Boswellia serrata and Curcumin. The medicinal properties of Boswellia are present in its resin. Resin possesses monoterpenes, di- and tri-terpenes, tetra cyclic triterpenic acid, and four major pentacyclic triterpenic acids. Boswellic acids, the active components have strong anti-inflammatory and analgesic properties. On the other hand, Cur­cuma domestic, was traditionally used in Indian Ayurvedic medicine to treat joint pains. Curcumin blocks inflammatory cytokines and enzymes, including cyclooxygenase-2 (COX-2), the target of celecoxib (Celebrex). It reduces pain, inflammation and stiffness in the patients with OPLL. Dosage: 2 capsules twice daily, after 30 mins of meal. Ashwagandha is rejuvenating herb and also very effective in treating immune disorder. It also prevents joint degradation and has anti-inflammatory action. Dosage: 2 capsules twice daily, after meals, with plain water. Ashwagandha, Giloy, Guggul, Shalaki, Nirgundi and Saunth. Thus, Joint Aid Plus is a blend of best Ayurvedic herbs against joint inflammation. Green Essential Capsules of Planet Ayurveda are very effective in the advance stage of joint problems as they are prepared from chloroplast of green leaves. Chloroplasts are known to have heavy metal deposition. Dosage: 1 capsule twice daily, after meals, with plain water. Diet plays very important role in OPLL, AS, Arthritis and all joint problems. Include ginger, garlic, turmeric, butter milk, black pepper, hot water etc in the diet. Heavy food, curd, frozen food should be avoided.